On this date in 1939, eight days after Nazi Germany invaded neigh­boring Poland, triggering World War II in Europe, Presi­dent Franklin D. Roose­velt declared a state of “limited national emer­gency.” The under­funded and under­manned U.S. mili­tary forces were strength­ened, and the next year Con­gress pro­vided major mili­tary bud­get in­creases, which led to the mili­tary ser­vices shaking them­selves out of their peace­time stu­por. Later in Septem­ber 1940, during the height of the Ger­man Blitz on Lon­don, the presi­dent signed the Selec­tive Training and Ser­vice Act, the first peace­time con­scrip­tion in U.S. his­tory. All male citizens between the ages of 21 and 35 were required to regis­ter for the military draft, beginning on Octo­ber 16. By that date more than 16 mil­lion men had com­plied when the first draft num­bers were drawn. 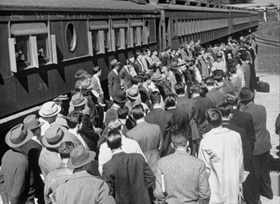 (By the end of 1942 the num­ber of regis­trants had jumped to 42 million.) Ser­vice was for one year only. The Army’s Quarter­master Con­struc­tion Divi­sion began building housing and recrea­tion facili­ties for over 1.2 million men at 245 loca­tions. Origi­nally esti­mated at $516 mil­lion, the actual costs to build the camps bal­looned to almost one billion dollars. 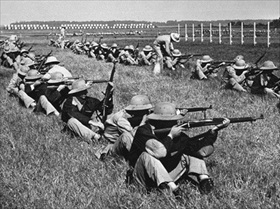 The size of the army grew from 267,767 men on June 30, 1940, to 1,460,998 by the middle of 1941, in part because the National Guard was as­simi­lated into the regu­lar army. 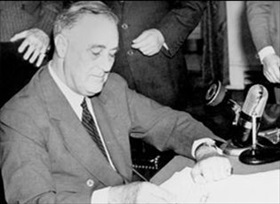 The Two-Ocean Navy Act became law on July 19, 1940. At $8.55 bil­lion, it was largest naval pro­cure­ment bill in U.S. his­tory, in­creasing the size of the Amer­i­can com­bat fleet by 70 per­cent with the addi­tion of 257 ships, among them 18 air­craft car­riers, 7 battle­ships, 43 sub­marines, and 115 de­stroyers. The naval ships and striking power were designed to sur­pass “any com­bi­na­tion of foes.” The navy also requested 15,000 air­craft. The Marine Corps expanded recruit training depots at Parris Island, South Caro­lina, and San Diego, Cali­for­nia. From 19,432 offi­cers and en­listed men in June 1939, the Corps expanded to a little over 66,000 at the end of Novem­ber 1941—a week away from Pearl Harbor. With war clouds on the Pacific hori­zon and tongues of flame every­where in Europe and North Africa, it is note­worthy that one year after pas­sage of the Selec­tive Ser­vice Act a bitter poli­tical fight broke out when Con­gress pro­posed ex­tending tours of duty by another year. The exten­sion bill passed by a single vote. Right: Newly enlisted U.S. Marine Corps recruits wait at the Yemas­see Train Station for trans­port to the Marine Corps Recruit Depot at Parris Is­land, South Caro­lina, 29 miles away, in Novem­ber 1941. 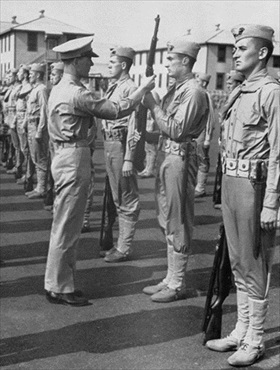 During the last month of peace, 1,978 men enlisted in the Corps. In Decem­ber, following Pearl Harbor, enlist­ments jumped to 10,224. That num­ber was smashed by a record of 22,686 enlist­ments in January 1942. 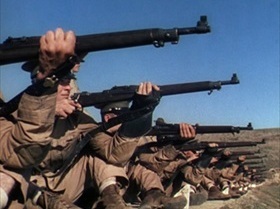 Left: Recruits at the Parris Island rifle range prac­tice “snapping in.” This was a repeti­tive pro­cess of dry firing. It drilled into boots the cor­rect sys­tem of wea­pons handling, sight align­ment, and trigger manipulation. Right: Recruits fire their service rifles at Camp Matthews rifle range in La Jolla, Cali­for­nia, near the Marine Corps Recruit Depot San Diego. Rifle marks­man­ship was so impor­tant that recruits spent more time devel­oping this skill in boot camp—two weeks—than any other single in­struc­tional subject. At the peak of the base’s activity in 1944, Camp Matthews put 9,000 recruits through marks­man­ship training every three weeks. Left: Boots stand a personnel inspection con­ducted by one of their com­pany officers at Parris Island Recruit Training Depot. Imme­di­ately following the Japanese attacks of December 1941, the Marine Corps’ autho­rized strength increased from 75,000 to 104,000 Marines. These huge num­bers put an im­mense strain on the recruit depots. Boot camp was cut from seven weeks in Novem­ber 1941 to five weeks on Janu­ary 1, 1942. A month and a half later the training sched­ule was in­creased to six weeks for newly forming pla­toons and in March 1942 training went back to the seven-week schedule. 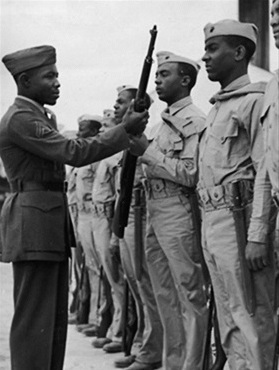 Right: When President Roosevelt signed Execu­tive Order 8802 on June 25, 1941, to pro­hibit racial discrimi­nation in the national defense indus­try, the Mont­ford Point facil­ity at Camp Lejeune, North Caro­lina, became the site of recruit training for the first African Amer­i­cans to serve in the Marine Corps.